Our family had never traveled to Tennessee. We recommend you do! There are so many family friendly, beautiful sites to see. 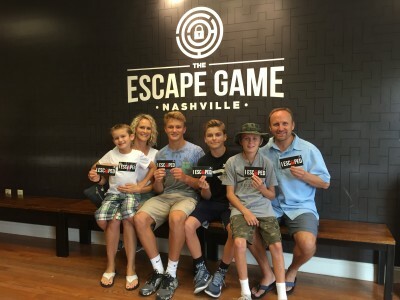 Here are a few highlights from our family trip to Tennessee: Blackberry Farm, Dollywood, Country Music Hall of Fame and Nashville Escape Game. Blackberry Farm, nestled at the base of the Tennessee smokey mountains, is a reprieve from life! I mentioned to my husband as we got settled into our room, “This place is slow.” And within an hour, I wished we could stay longer than 36 hours. With the literal “smoky” mountains quietly watching our every move, we took a golf cart and drove the acres of rolling green hills and manicured paths, along whites fences, organic gardens, and the bubbling stream. My 16 and 15 year old boys “unplugged” quickly and we found them pushing each other on a picturesque tree swing, where each underdog tossed them high above the hillside overlooking the beautiful boat house and fish pond. The tree swing was exactly what you would expect to read about in a romantic novel, but the boys made it into just what boys are best at…a thrill ride that made mom a little nervous! Our 12 and 8 year old boys went to Camp Blackberry as soon as we arrived. My tween begrudgingly went with his little brother, and I just kept hoping he would make the best of it. We ran into them two hours later and they were both all smiles! “This is more fun than I thought!” Whew! The darling camp counselors of Camp Blackberry were flexible and easy going, and successfully kept our easy-to-please eight year old, and our tween “judge” both happy with games, swimming, conversation, soap making and candy cooking crafts. Blackberry easily accommodated our gluten free needs as well. The new Well house Spa is a place where I would like to spend more time. The aesthetics of the whole facility, the materials, colors, layout, and setting were beautiful and serene. I took pictures of the fitness room and decided we needed to mimic the colors and decor in our home gym because it would lure me into working out more often! The next morning, undaunted by the rain, staff members took me and my three oldest boys fly fishing. Jackson, my 12-year old southpaw, and I went downstream to a bend in the stream where Jackson could cast lefty into the perfect fishing spot. Within a few minutes of helping him get the hang of it, Jackson reeled in a fish! 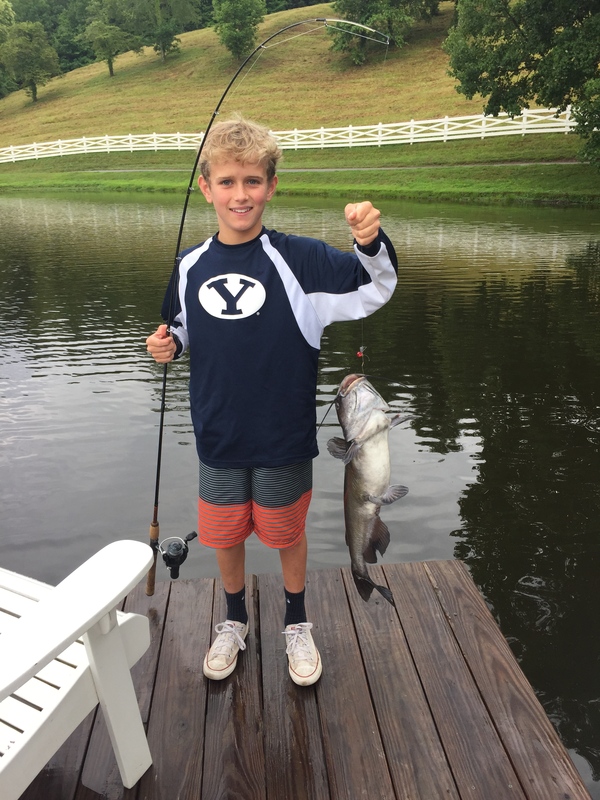 With visions of bigger fish to catch, secret tricks, and tales of giant illusive catfish and bass in the pond, the boys headed there after fly fishing. 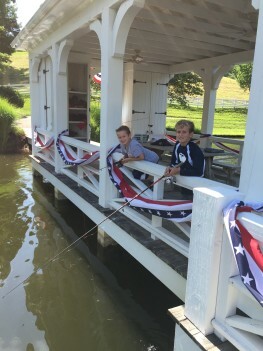 With provided poles, a pouch of homemade Blackberry Farm bread, a canoe, and encircled by lush greenery, I relished in the sight of my four Tom Sawyers and Huck Finns doing what boys love best on a summer afternoon…nothin’ but waitin’ for ‘dem fish to bite. Those visions of bigger fish quickly became fish tales. Jackson wrestled in the infamous 26″ catfish! One envious patron said she has been trying to catch that fish for five years running! Cameron, using Brandon and Dusty’s trick, caught a small blue gill which he kept on the line as live bait to tempt the bass. As we all looked on, a mammoth bass rocketed up from the depths of the pond, leaped out of the water swallowing the hooked blue gill whole and put up an exciting fight! …until the line broke. Cameron, green with envy that he had given the pole to Harrison, says the bass wasn’t that big. But Harrison swears it was at least a 24″ bass…and we believe him!!! Our last activity was family archery. Lincoln (8) had this to say: “Archery was super fun. 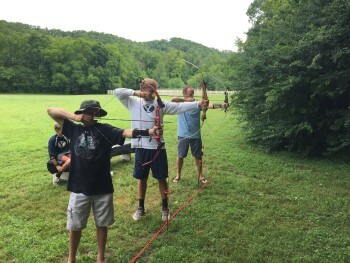 The staff were very helpful to teach me how to hold the bow and shoot the arrows.” We learned safety and form for the long bow and compound bow, and practiced target shooting on a variety of targets. The staff’s attention to detail, but casual manner and sense of humor, made it fun for all. I even got to harness my inner Katniss and shock my boys by making it into the semi-finals of a family tournament! Well said Jackson! Even though you sound like you are 32 rather than 12, I couldn’t agree with you more! Blackberry Farm is someplace that deserves another trip to. We hope to return here soon to the simple, slow days of perfect summer! 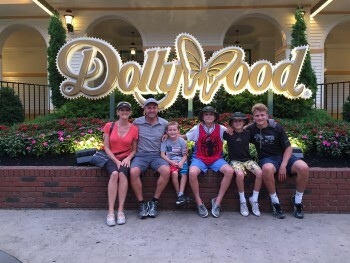 Another fun stop in Tennessee is Dollywood Theme Park. It’s everything you would want with entertainment, big rollercoasters (Wild Eagle was our family favorite), and park grub. It was also easy for us to find out the Gluten Free options (pizza and huge turkey legs included!). This is always a thumbs up for me. The absolute highlight on the day was the Gazillion Bubbles show. Who would have thought you could do so many incredible things with bubbles!!! And, my four year old niece was randomly selected to be on stage when Deni Yang simulated a snowstorm with his bubble magic. The lead up story was sweet, and when the lights came on and she found herself engulfed in bubble snow…no joke…I cried with the wonder with the child-like joy that my niece showed as she skipped around catching “snow” in her hands. And, if you are looking for a really entertaining evening event, I recommend the Dixie Stampede! You take a step back in time and enjoy a yummy BBQ dinner while watching the the North and the South compete with each other on horseback, with wagons, pigs and acrobatic equestrians. This is a worth a stop! Thanks Dolly! After seeing a concert at the historic Ryman Auditorium, and a performance of the Grand Ole Opry, the trip would not have been complete without going to the Country Music Hall of Fame. Truth be told, my boys are not big country music followers, BUT, they were surprised at how many artists they knew (T Swift and Carrie helped). We did the audio tour which was interesting and added a lot of “color” to our walking around, and the instruments and paraphernalia were really fun to peruse. They kids center had a “honky tonk hanky” making activity which kept the four boys happily busy for a little while. And, Lincoln also did the music scavenger hunt to earn a prize. It was a fun way to spend a few hours in the the Country Music capitol of the world. As soon as we were done breaking out of the Nashville Escape Game, I started googling if they had one of these in Northern California. THIS WAS SO FUN!!! This was such a unique and interesting family activity. It was challenging because we had never done anything like this before, and fortunately we were able to work together without wanting to strangle each other! Basically, you are stuck in a locked room and you just have to start looking for clues, connections, patterns, locked boxes…anything to figure out how to escape. It was NOT easy, but you can ask for clues from the “coach” that is watching you on video, and then use your thinking cap to figure your way out. We were successful! And, each of us had our “moment of brilliance” moment where we discovered a clue to help us through. We all felt a little smarter, and little more clever, and pretty pumped to do that again sometime. Interested in a trip like this one? Email info@globaladventuress.com to have a custom trip just like this one planned for your family! Global Adventuress would like to thank Country Music Hall of Fame, Nashville Escape Game, Dollywood, and Blackberry Farm for hosting us!